When I was a kid, our family friend, Captain Fred Cates, used to take us fishing on his beautiful sports fishing boat. Capt’n Fred was actually my grandfather’s friend. The former mayor of Hillsborough, he is a bastion of hilarious stories about my parents and grandparents. He also spent all of my elementary and teen years trying to set me up with his grandson, Chase. Who, as I was frequently reminded, has a four door truck. On these fishing trips off the coast of North Carolina, into the gulf stream, there was an award system. Golden hooks were awarded for biggest fish, most fish, so on and so on. I rarely won, and when I did go home with a golden hook it was usually because my father or uncle had helped me reel in the fish. Mostly I remember fishing for dolphin fish, but I’m sure we were after other game as well. Dolphin fish, also known as mahi mahi (which I refuse to say, seeing as how I am not Hawaiian), is a delicious fish. It is also, in my opinion, a beautiful fish. It has this incredible shimmer to it, changing from yellow to green to bright blue, depending on how the sun hits its scales. The meat is light and full of flavor, not fishy at all. For this recipe, I was looking for a good winter twist on a fish dish. Usually I like dolphin served with lime and cilantro. But, since it’s winter, I thought something a little heavier was fitting. So, I made a quick pecan breading, with a little spice to add a kick. I served it with lightly cooked asparagus that I topped with lemon and parmesan. It was scrumptious. Dan suggested that these might make a great appetizer, on toothpicks served with spicy mustard. 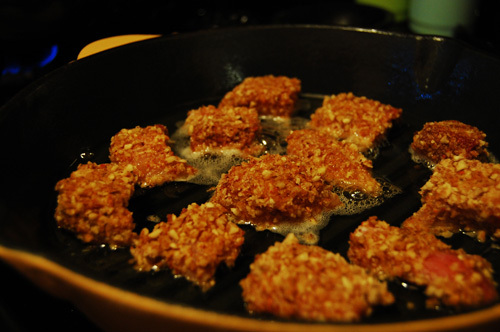 Rinse your filets in cold water, and pat dry. If your filet still has the skin on it, peel the skin off before you rinse. For instructions on how to filet a dolphin see here. Season with salt and pepper, and set aside. I sliced them into squares to increase the breading surface. Also, cutting them makes the filets go further portion wise. Dan and I split one filet, and combined with the asparagus, we were full. I actually didn’t even finish my half. 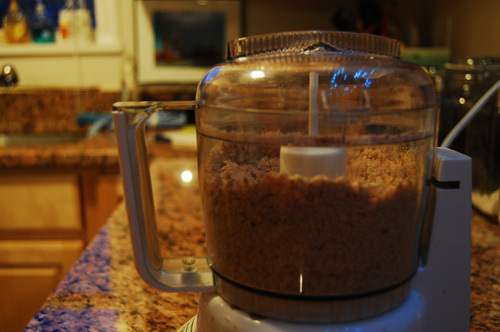 In the food processor, blend pecans, flour, sugar, salt and spices. 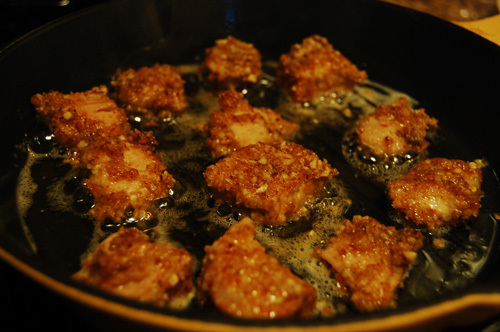 In a heavy nonstick skillet or cast iron pan, heat the peanut oil. Dip your filets in the dry mix, then in milk, then in the dry mix. Set aside. When the peanut oil is hot to the touch, drop your filets in. Cook for two to three minutes on each side. Use tongs or a fork to drop the fish onto a paper towel. Allow to cool at least a few minutes on the paper towel (which will also absorb some oil) before plating. Fill your saute pan 1/4 to 1/2 of the way with water. Add 1 tbsp olive oil and bring to a simmer. Rinse your asparagus and place in the pan. Slice your lemon in half. 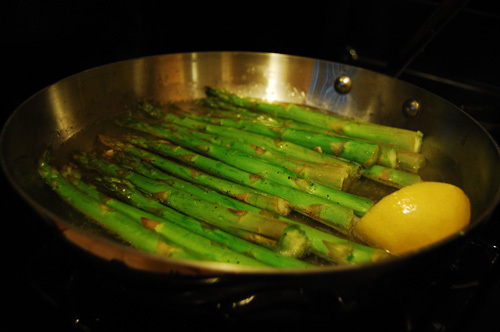 Squeeze half of the lemon over the asparagus, and place the lemon half in the pan. Cook the asparagus for 10 minutes, or until it has become a darker green. Plate your asparagus, then squeeze the other half of the lemon over it. 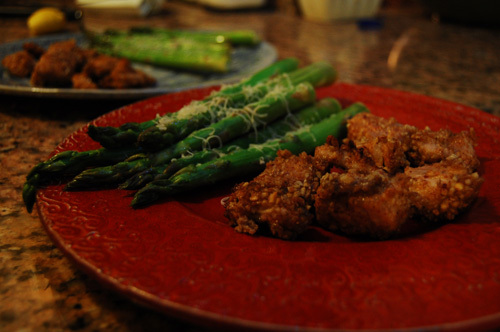 Grate parmesan over the asparagus and serve. I have never heard it called dolphon fish! That is really interesting. I am always looking for different ways to do fish! This sounds really good. We will try it soon! Thanks.